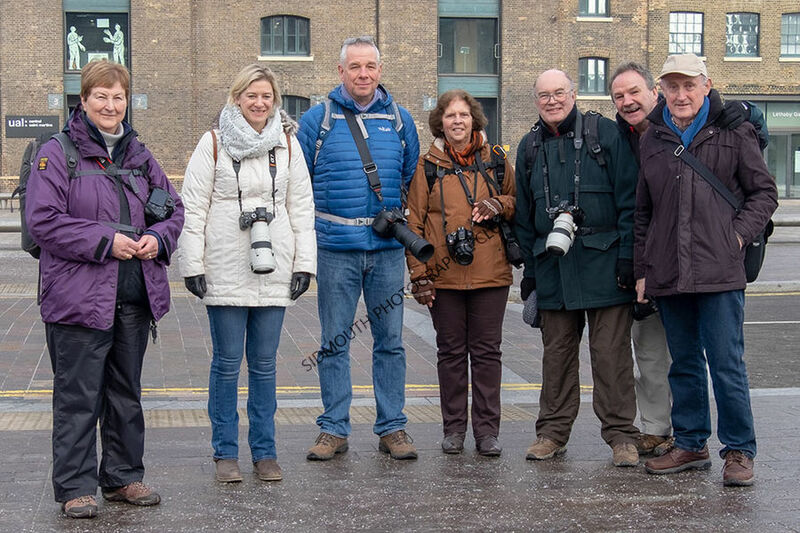 The forecast was for overnight lows hovering just above zero but the band of photographers from Sidmouth Photographic Club were in a buoyant mood on the train to London, anticipating two days of shooting in the city with some choice night time locations. There was a lot of discussion about the blood moon which was due that night and would be at its best around 05:15am; several members of the party were planning a night time sortie from the warmth of their beds at the Travelodge in Southwark to the banks of the Thames at a suitable location – read on to see how it all went! Our arrival at Waterloo was on time and after dropping off our overnight things and grabbing a bite to eat we headed over London Bridge to the City financial district for a look at the Lloyd’s building and neighbouring landmark offices – the ones with the catchy nicknames; the Gherkin, Scalpel and Cheese Grater. Progress was quite slow as individuals were constantly being side-tracked by interesting photographic opportunities, and we only “lost” one person, and for no more than ten minutes, which was a miracle in itself! By mid-afternoon we were in the queue to get the lift up the Walkie-Talkie for an appointment with the sunset viewed from the Sky Garden. Being Sunday afternoon it was quite busy but the huge public space at the top seemed well able to cope and it was not difficult to find vantage points to shoot from. Here we were constantly tempted by the numerous bars and comfy seats in the warm but dedication to our cause enabled us to concentrate on the mission! There were great views of the Shard over the river and on the opposite side much closer views of the City skyscrapers with Canary Wharf in the distance to the East. The sunset had some colour but was not stunning – at least there was one! After we had been up there for an hour, we headed down for some night shooting back in the City area. Over the period of an hour or so we worked our way over to the Heron Tower near Liverpool Street Station and then hopped on a bus to Tower Gateway and then by DLR to Canary Wharf. Once at Canary Wharf we headed straight for our dinner and fortification for a return to the outdoors (which was getting decidedly chilly). The Canary Wharf Estate was decked out with a “Winter Lights” display which made for some interesting and unusual images. We spent another couple of hours working our way round various photographic vantage points finishing up at Heron Quays Station before heading down onto the Jubilee Line, a comfortable half hour or so before the last train. By this time, despite layers of thermals, scarves, and anything else you can think of we were all quite well chilled through, due to the prolonged periods of standing around taking long exposure images. As we headed back to Southwark on the train, the prospect of doing it all again for the blood moon with less than five hours sleep in between was not being greeted with the same enthusiasm as it had been twelve hours earlier! By the time we got back to the hotel it was well past eleven and we decided to leave the blood moon to others. In the morning it became apparent that in our bit of London there had been a layer of cloud/mist low down in the direction of the eclipse and had we got up and struggled over to our chosen vantage point we would have seen nothing anyway – good decision!! Breakfast inside us, we set off for round two, dropping our bags off at Waterloo and then heading into the Underground - destination Kings Cross. Our objective was to take in the new developments around the Kings Cross and St Pancras area. After an ”incident” in the tube we had to divert our route via Baker Street which gave us an opportunity to shoot the interior of the old Metropolitan Railway station with its wonderful brick arches lit from above. Once at our destination, we dropped into Kings Place for coffee in the sparkling white office atrium, and then headed along by the canal and moored barges to Granary Square (see group picture). Then it was over to Pancras Square where Google have their London HQ and where there are lots of reflecting pools to exercise photographers’ imaginative skills, as well as the Rainbow Tunnel. We finished off this area by splitting into smaller groups to visit Kings Cross and St Pancras station buildings with their interesting architecture as well as people photography opportunities. By now stomachs were rumbling and it was time to hop on the tube to London Bridge and take up our lunch booking in the Hays Galleria on the South Bank. The last of the afternoon light was spent around City Hall and Tower Bridge. Here, some members spent time trying to get the classic picture of a motion blurred bus coming through a bridge tower archway – should be interesting to see what emerges as it is not as easy as it looks! Once dark, we started back along the South Bank towards Waterloo taking in the myriad of photographic opportunities along this two mile stretch. We had allowed nearly three hours for this part which gave us time to revisit the City Hall area in the dark, HMS Belfast, and the area round the Millennium Bridge as well as the bits and bobs in between. Back at Waterloo we picked up provisions for the return journey, and were in nice time to catch the last train back to Honiton which would see us home by midnight. All in all, an excellent two days of photography in great company for a thoroughly enjoyable trip.